Alfred Roller (1864 Brno – 1935 Vienna) was an artist and designer who made his greatest impact as a stage designer. With Gustav Klimt and others, he was one of the founder’s of the Vienna Secession (1897), the multi-disciplinary group of artists that broke away from what they saw as the conservative Vienna Academy and its historicist style, to create new, modern art. Like his artist-colleagues, Roller also taught at Vienna’s Kunstgewerbeschule (School of Applied Arts). For the Secession, the Gesamtkunstwerk (total artwork)—a unification of artists and craftsmen of different disciplines (painting, sculpture, architecture, design, etc.) in the creation of an overarching concept—was the new ideal. Roller was the founding editor of the Secession’s, Ver Sacrum, an artistically designed and illustrated publication that included text, music, and poetry. He participated in the planning and design of the Secession’s exhibitions, and his new, modern style of exhibition design was exemplified in the 1901 Secession exhibition, which featured paintings by Giovanni Segantini and sculpture by Rodin. 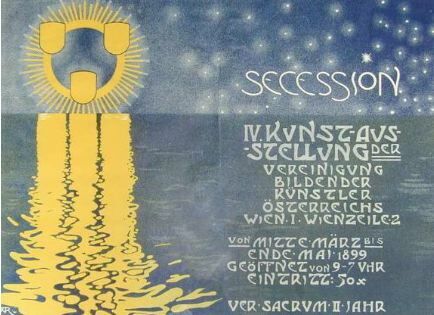 The Secession’s Beethoven exhibition (1902) was, perhaps, the group’s greatest expression of the Gesamtkunstwerk. For the exhibition, the Secession building was devoted entirely to Beethoven, with his music playing (in an arrangement by Gustav Mahler), the display of art and design created especially for the occasion (notably, Klimt’s Beethovenfries) and, at the exhibition’s center, Max Klinger’s monument to Beethoven. Roller also applied the ideal of the Gesamtkunstwerk to his set designs. From 1903 to 1907, he was set designer to Gustav Mahler during the time the composer was music director of the Vienna Hofoper (Court Opera), where they did ground-breaking work together. Collaborating closely with Mahler, Roller realized and completed the musician’s vision through staging. Roller’s innovative stage design placed a new focus on light, color and space, with simplified staging. Roller went on to become head designer at the Vienna Opera and at the Burgtheater. He also designed the original productions of Richard Strauss’s Der Rosenkavalier and Die Frau ohne Schatten.